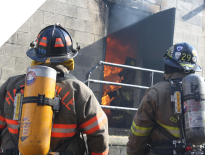 In the Firefighter (FFS) program at Belmont College, you will learn about the science of firefighting and fire prevention as well as about the safety and hazards associated with fires. You will also study the behavior, combustion, suppression, and cause of fire and its related emergencies. The Firefighter program is a combination of related fire service and general education courses designed to give students the knowledge and skills necessary to perform the duties of firefighters. 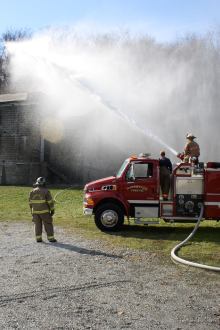 Coursework includes specialized subject matter, practical, and vehicle experiences which focus on the practices and techniques of firefighting in accordance with the Ohio Department of Public Safety, Division of Emergency Medical Services, Office of Fire Services’ requirements. Students will complete courses for initial firefighter certification, fire science core classes, various elective awareness and rescue courses, and live fire training. Students that successfully complete the initial training courses will be eligible for State of Ohio certification testing, as stipulated by the Ohio Division of Emergency Medical Services, Office of Fire Services. Each initial training course is a stand-alone course that leads to Ohio certification; students can take core and elective courses for interest or for continuing education credits which may be required for those already certified. Belmont College prepares successful graduates for future entrance into the fire service, for volunteer firefighter positions, and for the state certifications needed to apply for a paid position with a fire department. Demonstrate the ability to understand, apply, and evaluate information relative to performing the duties of a firefighter. Demonstrate proficiency with all technical skills concerned with the practices and techniques of firefighting. Demonstrate professional attitudes and behaviors consistent with the expectations of area employers and the local, fire services community.